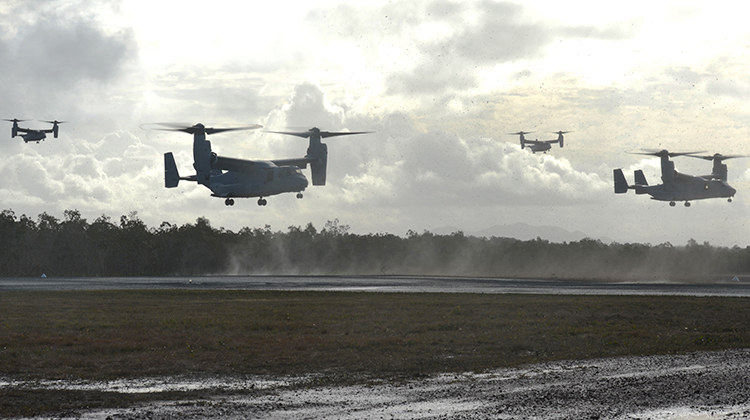 The US Marine Corps (USMC) will deploy its largest helicopter and tiltrotor element to northern Australia yet when its next six-monthly rotation to Darwin gets underway in April. 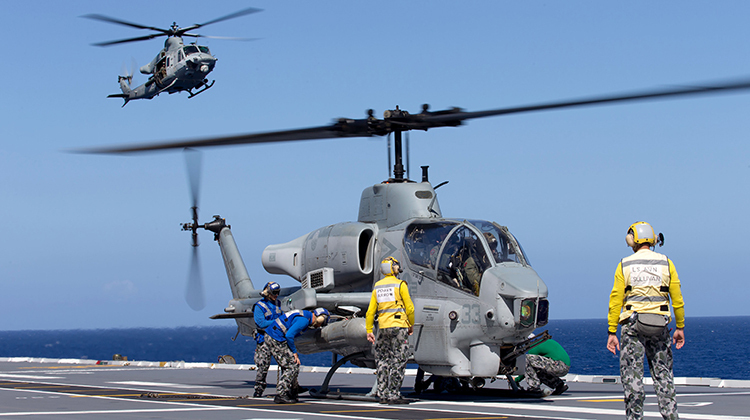 The sixth rotation since deployments to Australia were first announced on November 16 2011, the aviation combat element of 13 helicopters and 1,250 personal of the Marine Rotational Force – Darwin (MRFD) will be based at RAAF Darwin and will comprise four MV-22 Ospreys from the Marine Medium Tilt Rotor Squadron 268 (VMM-268), and AH-1W Super Cobras and four UH-1Y Venoms from the Marine Light Attack Attack Helicopter Squadron 367 (HMLA-367). Would love to see some Kangaroo roundels on the Aircraft in picture one, don’t care which service. Maybe one day, LR Medevac req the most likely according to the DWP. i think there is more chance of a V-280 Valor having an aussie roundel than an osprey! thats only because its smaller. Have you ever read the pilots manual MV-22 ? sugest you read III-8-27 Launch recovery envelopes and then get back to me with that statement . Great ! Will the cobras fly with the tigers at any point ? Thank goodness for the US, we sure need their presence in the ‘Top End ‘. Wasn’t that many years ago we had Zeros bombing Darwin and we had scarce resources to throw back @ them. Seriously? You said, “wasn’t that many years ago we had Zeros bombing Darwin”. Mate, that was 75 years ago! Are you serious?? Are you locked in a time warp or something? The world, and our part of the world, had changed significantly in the last 75 years. Whilst I certainly welcome the USMC presence in the Top End (for the reasons they are there), but it is nothing compared to what ‘we’ have based in the Top End today. Darwin is the best defended bit of real estate in Australia, betwern a Fighter squadron at Tindal 300ks away, a fair % of our Armour and a Brigade of Infantry at Robertson Barracks, throw in the Marine rotation it’s about the last place you would attack. Hey John,I’ve missed ya.When are we going to debate the JSF? It’s on order, it’s happening, and it’s coming to airspace near you soon, whether you like it or not! And thank goodness the RAAF and the Government had the foresight to get involved and to place orders. Paul, mate! Happy New Year! Well mate, its been Christmas, new year and summer, I thought it would be nice for the ‘anti-F-35 brigade’ to wallow around on the beach like elephant seals, enjoying the sun while it lasted (so I’ve kept my mouth shut), gee I’m a nice guy!! Now not that this is the correct forum or post (USMC aircraft in the Top End), but it appears that things are proceeding well with the F-35 program. The 200th operational aircraft was delivered a few weeks ago (for Japan), Negotiations on LRIP 10 are getting close to being completed, looks like the F-35A will be under $100m for the first time (yes of course that is in US$ too), reports are suggesting that by 2019 the F-35A will be close to the $85m per airframe cost as production ramps up. By about the end of 2018, there will probably be about 350 airframes completed (LRIP 9 & 10 airframes). From what I understand the next 8 airframes for the RAAF will come from LRIP 10. Israel has received its first couple of F-35’s and appears to be more than happy with what has been reported. Yes of course there is the usual ‘anti’ and ‘pro’ media reports, all get’s a bit boring, but anyway…. So there you go Paul, my ‘Summer F-35 report”, as brief as it is! Raymond,I was only saying it as tounge in cheek to John.I respect John and some of his points are very good.First of all Raymond,U have not read my post closely enough! !I am not a JSF kicker understand that very clearly.I can separate fact from fiction better than you.Its not a debate really,but as you said,separating fact from fiction.As I have SAID,I hope it really works better than anyone on this forum.Remember all these nations that have ordered it,want a big slice of the pie in terms of contracts and workshare.I don’t hate the jet,I think it has a lot of fantastic tech in it.Why do you think the Chinese and Ruskies are trying to steal its secrets!!! Some of your posts make me laugh mate.You are really good at putting all your eggs in one basket.John hope your well mate and I enjoy our little chats.